New Delhi: To understand what was at the core of Operation Shakti, IANS caught up with its centrifuge Praveen Chakravarty to understand what the Congress was attempting for the BJP had them on the run till recently.As he says, "I was quite sanguine initially on this whole metamorphosis but when I saw the Congress President calling a worker by name and talking to him and the response that he was getting, I realised that the wisdom of the crowds could not be faulted, involve the people in everything which is the real offshoot of true democracy or peoplecracy. "That is how 30,000 people were surveyed in Delhi to find out who should be Congress President for Delhi. "In fact every candidate was selected in the three north and middle India states using this interface, including the Chief Ministers. The template being 'Wisdom of the Crowds', a seminal book by James Surowiecki, New Yorker business columnist with boundless erudition explores the simple idea of large groups of people are smarter than an elite few, no matter how brilliant and better at solving problems, fostering innovation, coming to wise decisions and even predicting the future. "Data is available, my experience and expertise as a political scientist helped and one found over a six month period that data is pure gold and that is what one needed to plug and play into. "Apparently, the Congress President is an extraordinary believer in the objectivity of data and the primacy of this being the gold standard to crack the election code. Chakravarty, a former Goldman Sachs Wall Street banker -- who worked with Nandan Nilekani in the past in UIDAI and then in Manmohan Singh's PMO -- the Wharton-educated data scientist known as 'Chucky' says, "We have learned a lot from these state elections -- what worked, what didn't -- and have started transposing this learning for the Lok Sabha elections. "Plans are now afoot to craft our campaign accordingly, this is work in progress and it it will be done after collecting ground zero feedback from multiple locations. "It will be ground up in terms of choice of candidate, mediums of communication, issues at hand, the whole ball of wax. All my output goes directly to the Congress President only. He then gives direction on the way forward. "The battle of 2019 will be fought across 2,00,000 polling booths and the issues will vary from place to place.For instance in the state elections, just to give a flavour, the Congress found that landless farmers and youth were livid over in DeMo in Bhopal. Upper caste wanted reservation somewhere else etc. Chucky studied at BITS Pilani and worked with IBM in Japan and at Microsoft on Windows 95 and did his Masters from Wharton before plunging into the high jinks world of investment banking only to move back to India in 2005. His belief is that there is no general election in India, it is a sum of parts as 29 states go to the polls at the same time. As he added, "National election is a myth. Our approach is to attack each state differently for every state has myriad problems. Our incessant surveys and people inputs have shown us that Notebandi resulted in a scarcity of jobs, it transcended across class, gender, economic strata. It's overnight announcement in that it became law as of midnight November 8, broke the back of the people in this country." The Congress is buoyant on its Gabbar Singh Tax stratagem which it claims has worked. They will take on an incumbent in Narendra Modi but a defiant Prime Minister whose people connect skills are unquestionable. Somewhere in this convoluted narrative, the Congress is expected to focus on the economy for it reckons that the economy is resembling a shipwreck. At the vanguard of the Congress electioneering campaign will be "scarcity of jobs, pricing erosion for farmers, ever-lowering demand for MSMES, another casualty of 'notebandi', which will bring the focus back on the economy and how it is hurting people of all hues". Chucky also confirmed that another imperative was the Reserve Bank of India (RBI), which worked consistently with the voter as the GOP tried to pinpoint areas of economic weakness which included the emasculation of the venerable institution.The Congress morale is upbeat as if it has been given an adrenaline shot, winning helps and three states are like 'sone pe suhaga'. New elements have been introduced in the Congress campaign, there is freshness in its approach in the main people connect. The BJP won 62 out of 65 LS seats in the 2014 general elections in Rajasthan, MP and Chattisgarh. Empirical data from these state polls reveals that they have lost 50 of these if LS polls were to take place today. Of course, state polls, by polls and general hustings are fought on different issues. In parallel with the general elections, three important states will go to the polls -- Andhra Pradesh, Odisha and possibly Jammu and Kashmir.Immediately after the national polls, Maharashtra, Haryana and Jharkhand will go to polls. 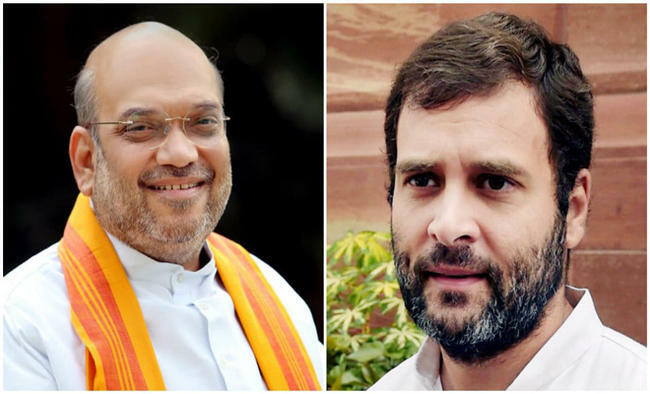 The Congress won 206 seats in the 2009 polls to romp home as the single largest party, but by December 2013, after various state polls, the total had been reduced to 106 if one was to collate assembly poll data. So, if the Congress ended up with 44 in May 2014, it was no surprise, for the erosion was rapid and severe. Not a similar litmus test awaits the BJP besieged by incumbency.